What makes my head turn? The neck muscles involved in the involuntary posture in cervical dystonia need to be identified for Botulinum toxin injections and physiotherapy. Here are some hints. The head is placed on the top of the cervical spine and can pivot about 90 degrees on both sides. The pivot of the head is possible if one neck muscle is pulling forward and if another one on the other side is pulling backward. is the muscle pulling forward and rotating the head to the opposite side (right SCM turns the head to the left). is the muscle pulling the head backward and rotating the head to the same side (left Splenius turns the head to the left). The SCM muscle is a long superficial muscle easy to palpate on the front of the neck, and the Splenius is a deep muscle, difficult to palpate, behind the ear. 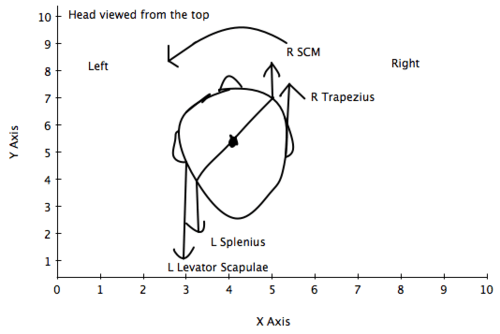 The Trapezius is a superficial muscle and can contribute to the rotation of the head to the opposite side, working together with the SCM (the right Trapezius will contribute with the right SCM to the rotation of the head to the left). These muscles are the most frequent targets for Botulinum toxin injections to control the dystonic rotation of the head. The palpation of these muscles is important, as dystonic muscles feel more bulky under the fingers.